Casey Affleck as C. Photo by Bret Curry. Courtesy of A24. DVD, Blu-ray, Netflix and Redbox release date October 3, 2017. Like “A Haunted House,” “A Ghost Story” is and is not a ghost story and like “A Haunted House,” is ultimately a love story. Rooney Mara and Casey Affleck play M and C, a couple living in a house somewhere. He wants to stay because he feels a sense of the history they have together there. She wants to move, and his unwillingness to discuss their future weighs on their relationship. Then he dies in an auto accident and is on a table in a morgue. 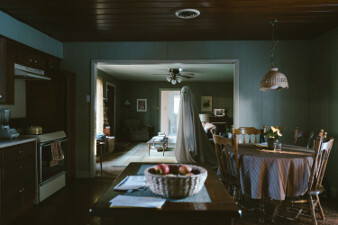 The camera frames the viewing room and his body under the sheet, until, after she sees him for the final time and departs, he rises slowly from the table. The camera sits, not for seconds but for minutes. Lowery renders the ghost, not as ectoplasm or vortex or translucent dismembered head, but reduced to a child’s Halloween costume – a mere sheet with cutouts for the eyes. The sheeted ghost is fitting for a deceptively simple plot: A man dies and his ghost has nowhere to go but home. In fact, the austerity of Lowery’s cinematic effects contributes, like Woolf’s elusive syntax and carefully measured vocabulary, to a narrative arc that moves from lyrical to symphonic in a mere 92 minutes. Lowery employs ghost story tropes – tracking shots down empty hallways; a creaking door; buzzing, flickering lights; an unexpected crash or two – but nothing that might cause fright. The cinematography by Andrew Droz Palermo has an almost monochromatic feel in the interior shots, but when the story ventures out of doors, the landscapes are rich and vast. Lowery asked that Daniel Hart’s haunting original score draw inspiration from Woolf’s story, and the concluding piece “Safe, Safe, Safe” echoes the sibilance and the comfort that the line imparts to Woolf’s tale. Again and again, the score incorporates the Picardy third – raising the third of an expected minor triad by a semitone to create a major triad resolution. This produces an effect of joyousness when our expectation is melancholy. Not surprisingly, then, Beethoven’s “Ode to Joy” will figure into the thematic concerns of the film, as well. 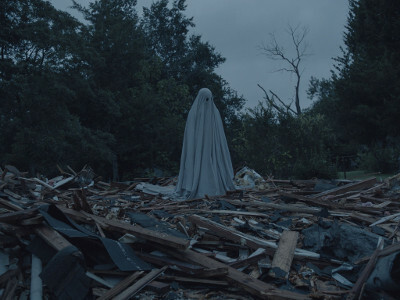 “A Ghost Story” is structured in juxtapositions of montage sequences and static shots. In the era of the fast-cut, Lowery is not afraid for the camera to do nothing but record. An establishing medium long shot becomes the static point of view for an entire scene. Not only does this challenge our conventional contemporary movie-going experience, the approach imposes the experience of time on us. For many, movies are a means of escape, and escapism is to be distracted from the experience of time. That terrible, almost tragic, expression about killing time expresses a desire to kill something so dearly precious and limited. Lowery seeks, instead, to intensify the experience of time, and then, by contrast, move us through a series of montages that communicate the passage of days, then years, then centuries. ATMOSPHERIC VISUAL STYLE AND MELANCHOLIC LYRICISM -- Casey Affleck as C. Photo by Bret Curry. Courtesy of A24. Richard Linklater was born in Houston, Texas, in 1960, and the Linklater films that interest me most are those that take on issues of time and our place in it: the animated “Waking Life” (2001), which questions the nature of reality, consciousness, free will and existence itself; the “Before” trilogy filmed over the course of 18 years – “Before Sunrise” (1995), “Before Sunset” (2004), and “Before Midnight” (2013); and the logical – though radical – extension of the trilogy concept, 2014’s “Boyhood” filmed over the course of 11 years. This approach – the examination of time through real time – is Linklater’s signature method, and one wonders where it might take him next. The 36-year-old Lowery hails from Texas, too. Born in Milwaukee, Wisconsin, the family moved to Irving, Texas when David was seven. Whether as an effect of the landscape of the southernmost region of the Great Plains, the proximity to the Atlantic Gulf or the sheer size of the state, Malick, Schnabel, Linklater – and now Lowery – share an interest in our experience of time – the fact that we are trapped in it while possessed of the inventiveness, if not to transcend it, at least to reimagine it. Taking very different approaches each director contemplates the existential experience of time and its companion, loss. Eternity is both tragic and majestically mysterious. Not long after our ghost has returned to his house, he goes to a window that looks out onto the window of the house next door where he sees a similarly sheeted ghost inside. The two ghosts exchange wordless hellos, understanding each other telepathically. The neighbor ghost explains that she’s waiting for someone. Our ghost ask, “Who?” “I don’t remember,” she replies. I agree with Lane about the intensity of this moment sans any CGI ostentation, but I did not find it altogether sad. Rather, I read this scene as one of hope. Neither that some greater force condemns us to a Purgatory from which we are released after a designated time nor that we die a second literal kind of death. Might there be hope in choice, in our own agency to give ourselves up to a cycle that is universal and eternal? In an early scene, M explains to C that, as she has moved from house to house through life, she leaves a tiny note hidden in each – something it is in our human nature to do – leave a piece of ourselves behind, something that says “I was here.” This theme, the desire to leave our mark, circles through “A Ghost Story,” and in that regard, the film is also a story about art – and what is art but an expression of love. Perhaps it is only great artists who leave a mark with any meaningful impact, but we all make some gesture, even if it’s just a tiny slip of paper that carries our handwriting pushed into a crack in the woodwork by which we hope to be remembered. Yet in time, even memory will be lost. We will no longer remember those we’ve loved and lost. But time will go inexorably on – in its grandeur and its indifference.